One of the earliest batch files was the autoexec.bat, which is a batch file that loaded each time computers with MS-DOS and early versions of Windows started. A simple batch file only requires a basic understanding of command line commands and does not need programming skills. 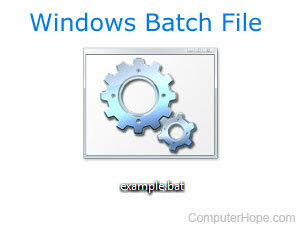 How to edit a batch file. What commands are available in a batch file? How to make a bat executable. How to shut down and restart the computer with a batch file. How to run a batch file each time the computer boots. How can I start an exe in a batch file? How to create a delay in a batch file. How to execute commands in a batch file in timed intervals. How to create a blank line in a batch file. Deleting files equal to 0 in a batch file. How can I run a batch file at a specific time? How can I run a batch file or other files minimized? How to run a batch file in fullscreen. Searching for a string of text in an MS-DOS batch file. Hide REM lines from showing in a batch file. How to use choice and set in a batch file. How to start Windows files and programs from a batch file. How to make a time and date log in a batch file. How to change the title of an MS-DOS window. Preventing an MS-DOS window from automatically closing in Windows. Deleting files in MS-DOS without a prompt. All questions and answers on MS-DOS and the Windows command line.